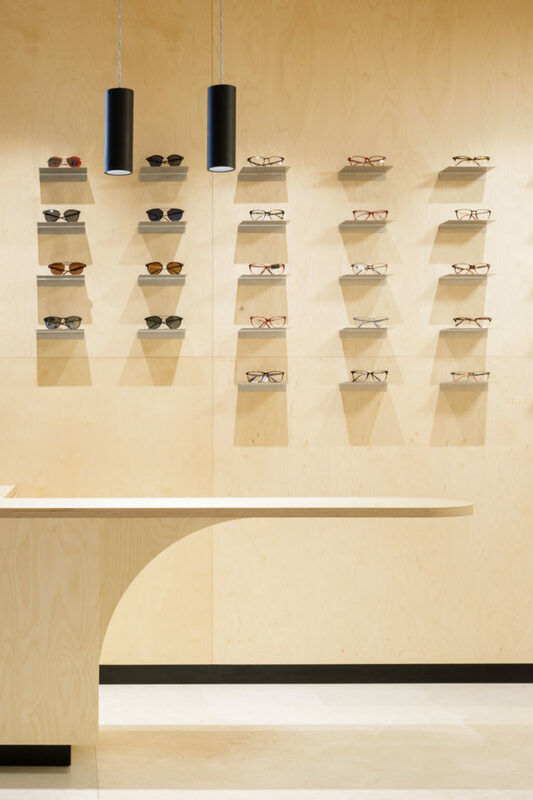 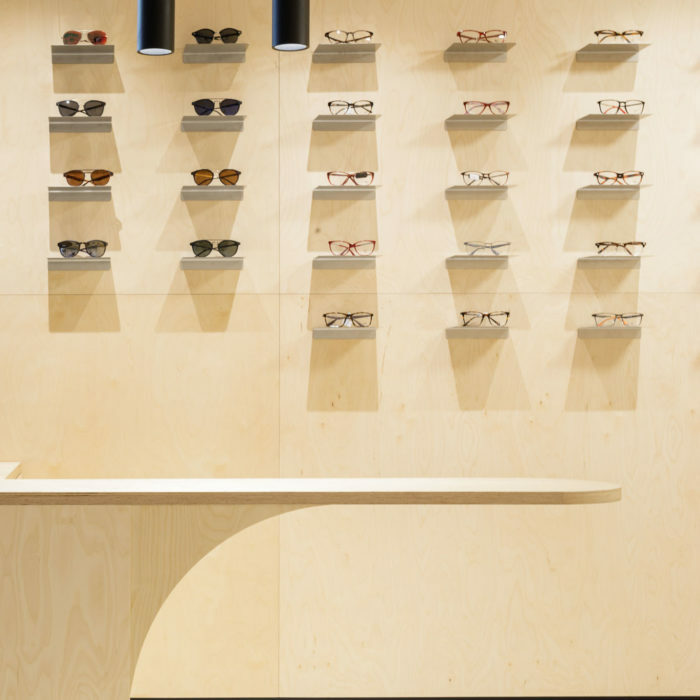 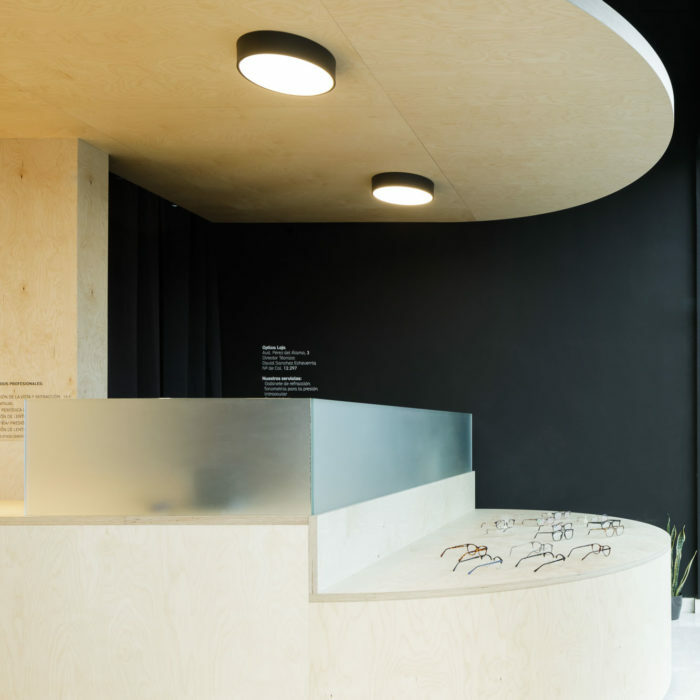 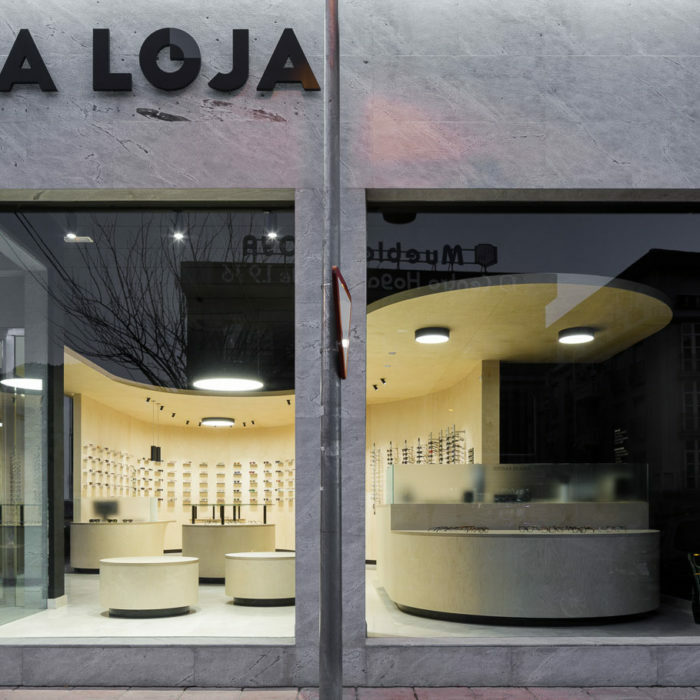 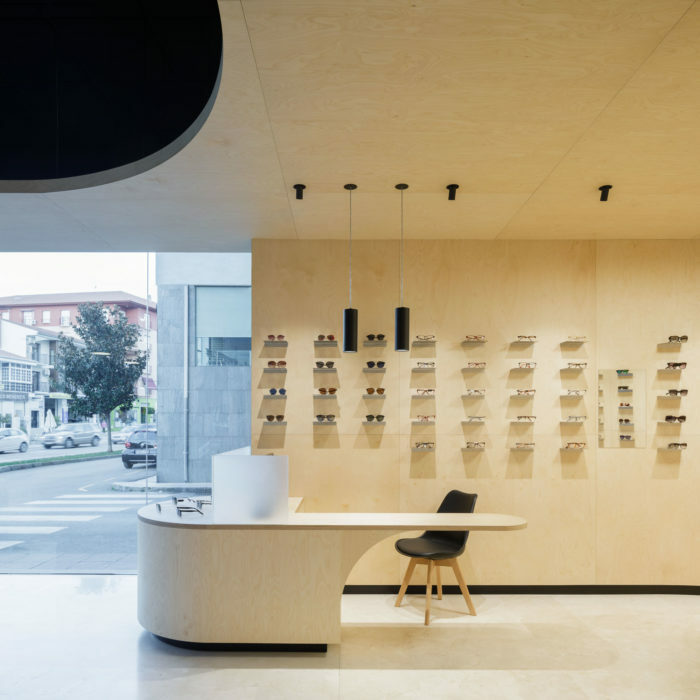 A free-standing piece of furniture made of birch produces both an embracing and a panoptical effect with its concave forms within the main space of the new “Óptica Loja”. 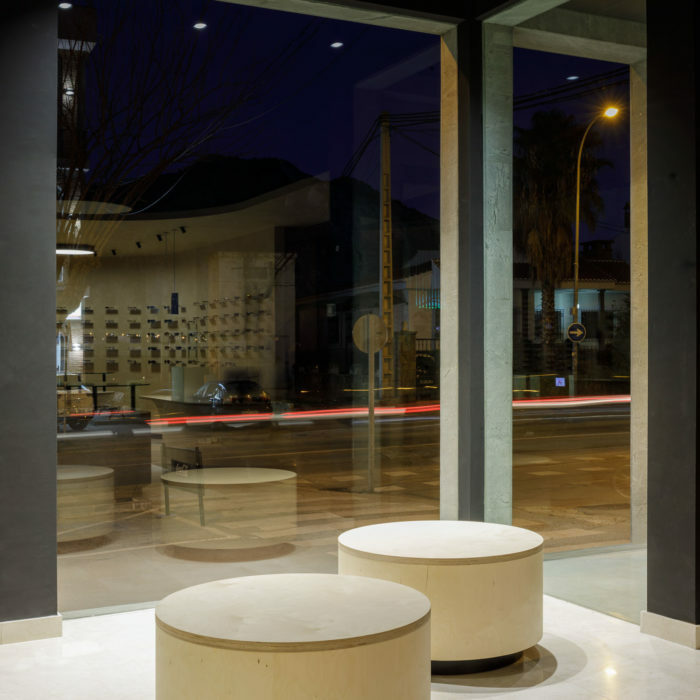 It is a simple formal gesture that revolves around the customers, set in the cozy enclosed space of a store finished using a single material. 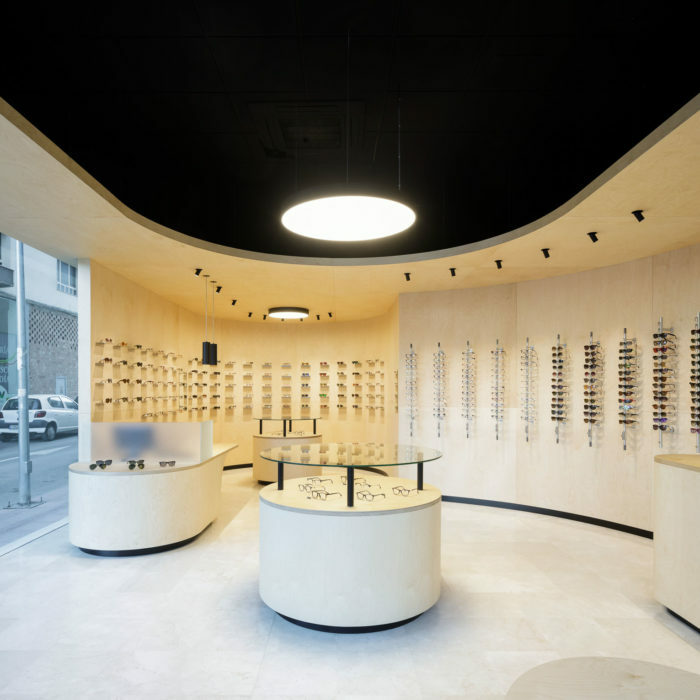 It allows visualizing the entire space and invites customers to meander along its curved showcases. 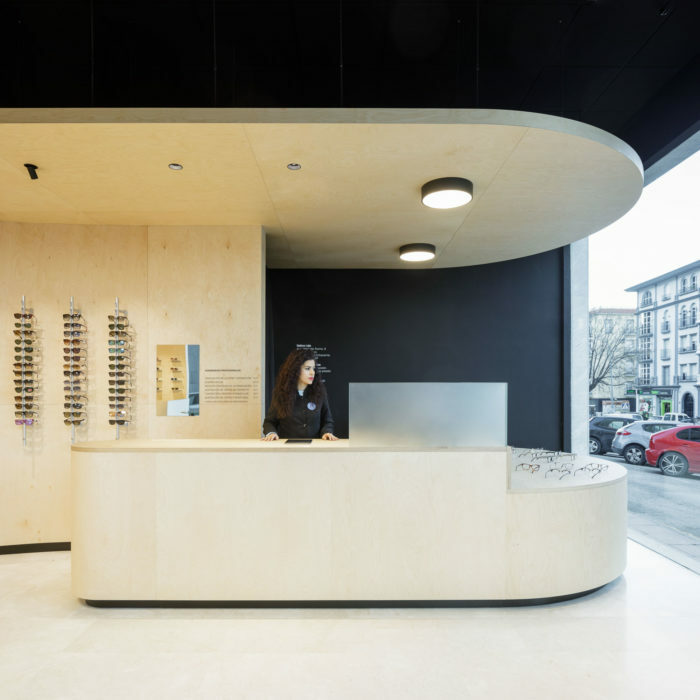 The ample commercial space is organized around this piece built with curved plywood panels with a birch finishing that divides two spaces: the public area, which is concave, and the private area, which is convex. 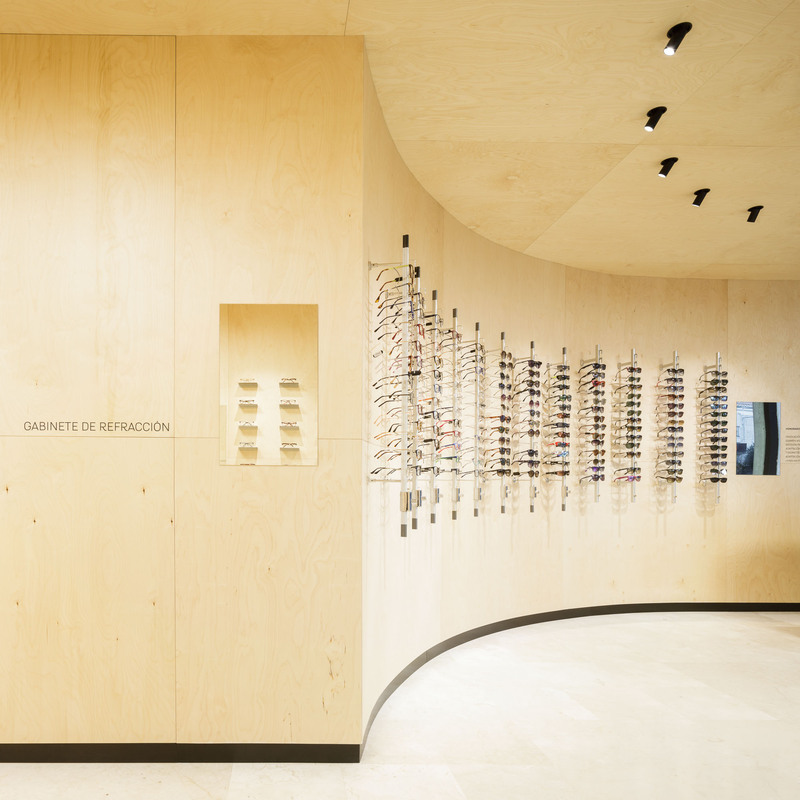 These curved shapes define both the main separating element between the two areas and the rest of the furniture-showcases, seats and counters, while they also unify and give continuity to the ensemble, generating curved itineraries and panoptical views of the merchandise. 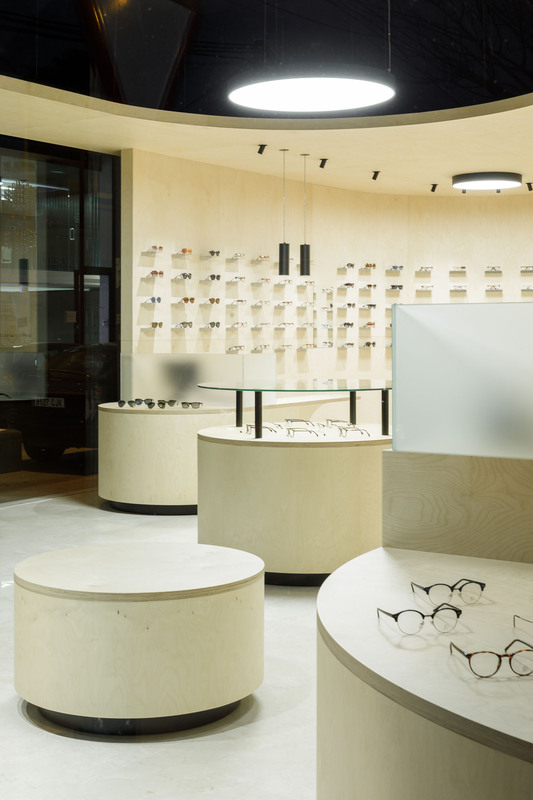 In this way, both from the entrance and from the middle of the public area, and thanks to the curved walls, the entire sales area is dominated. 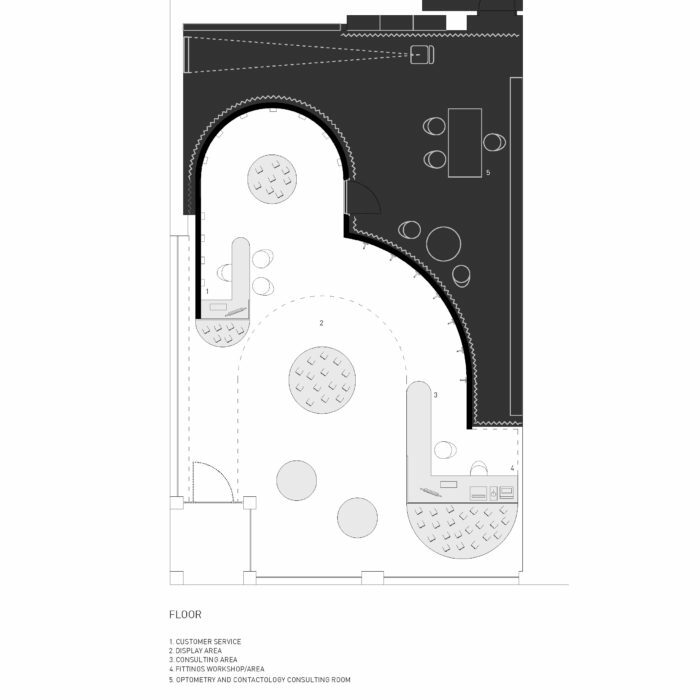 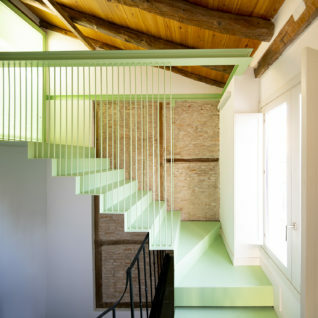 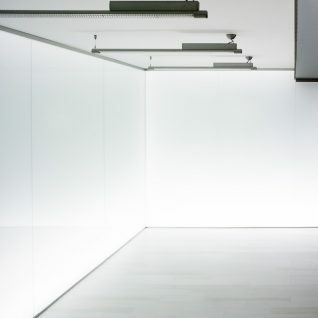 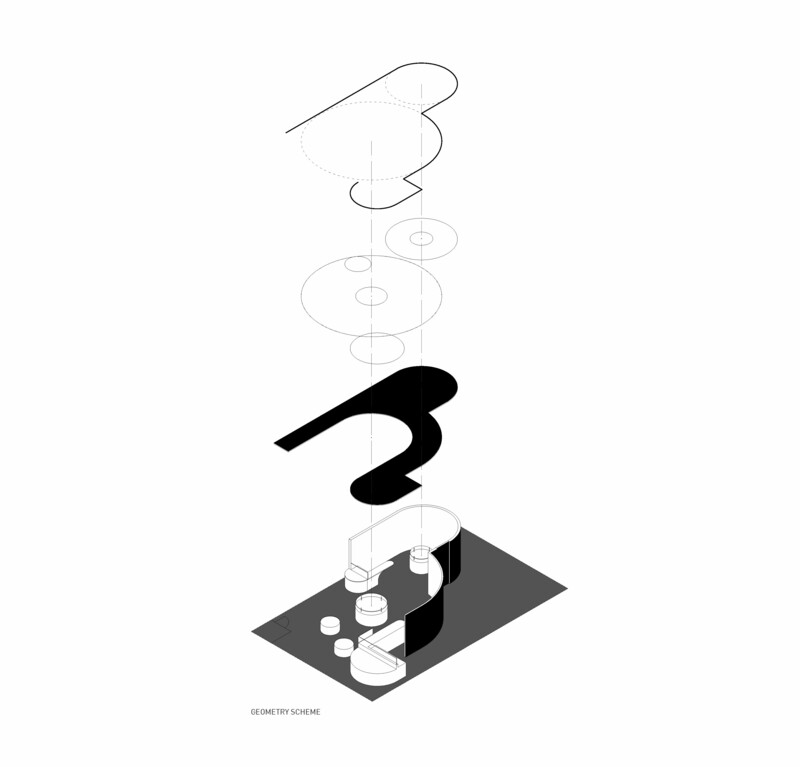 This furnishing element divides de the original space both horizontally and vertically, creating two environments thanks to its different proportions and concavities. 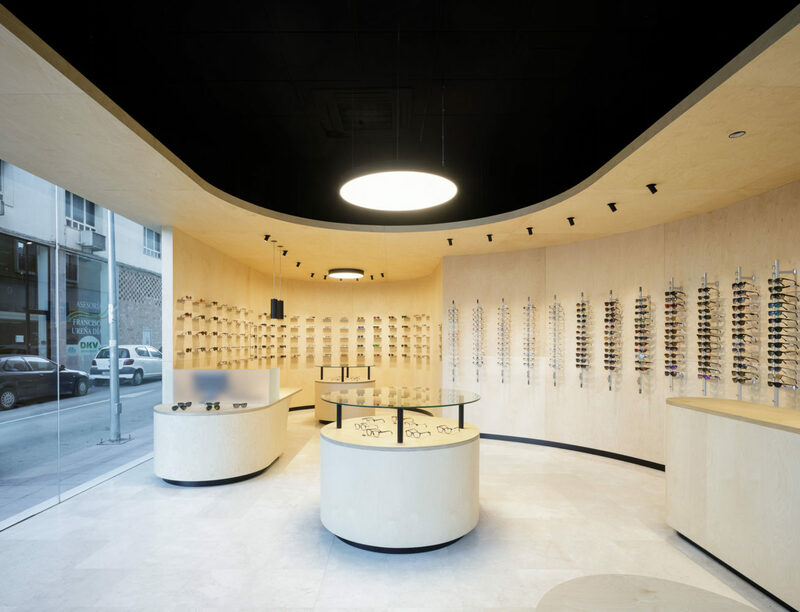 After entering the shop, one accesses the first space marked by a larger curve with a diameter of 6.25 m; it includes the welcome counter and its height maintains that of the original store. 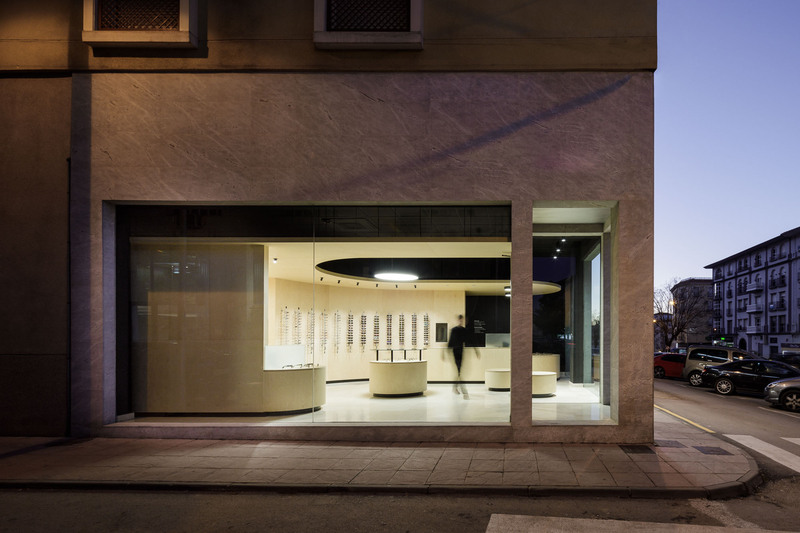 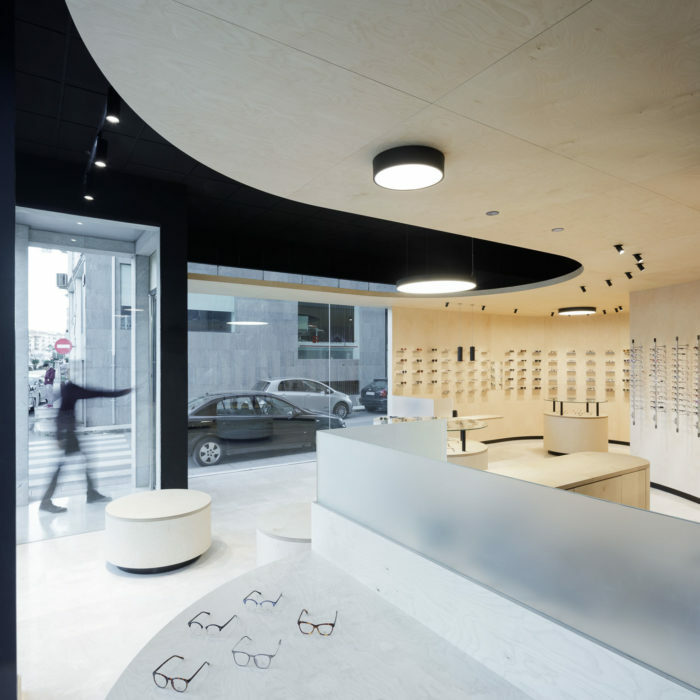 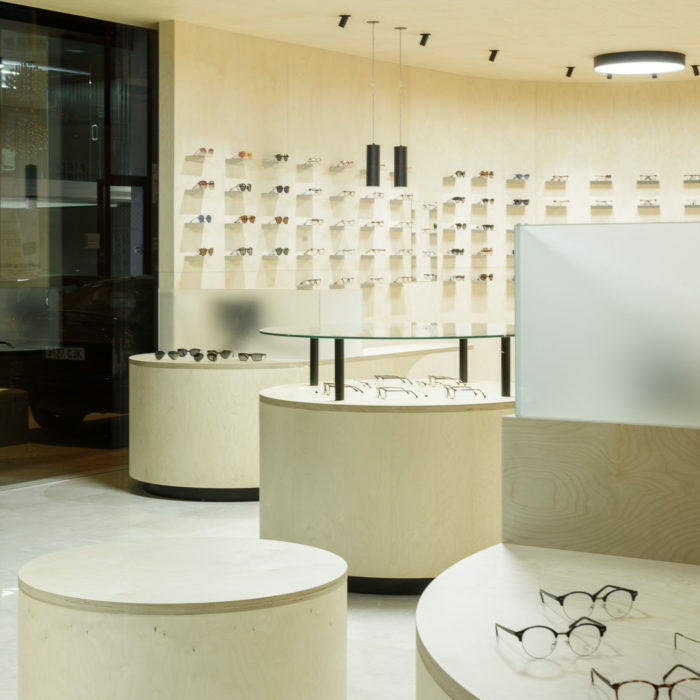 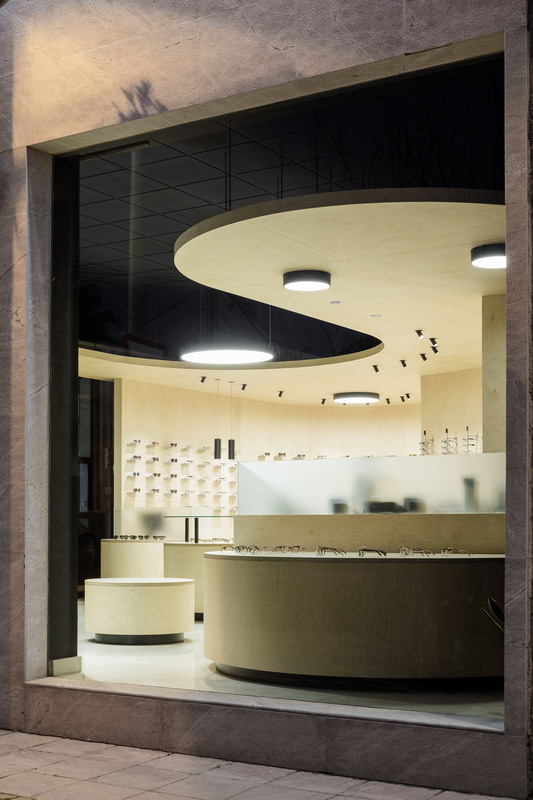 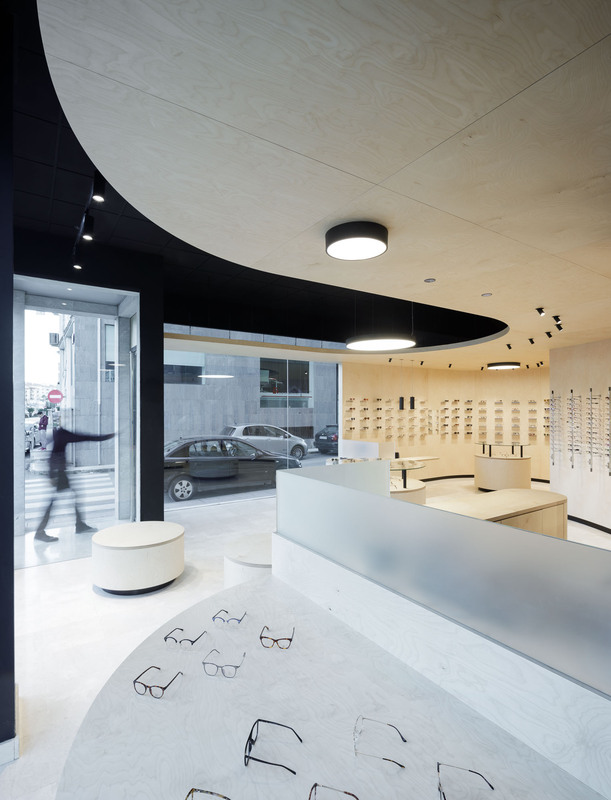 From there, customers enjoy a panoramic view of the optical store and all of its products. 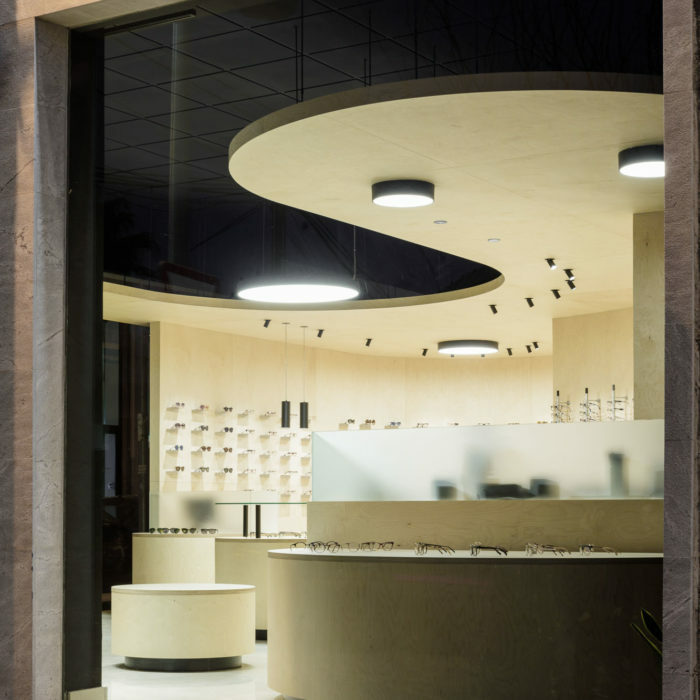 The showcase in the shape of a circular table and the round lamp that hangs above it further highlight the centripetal sense of this first space. 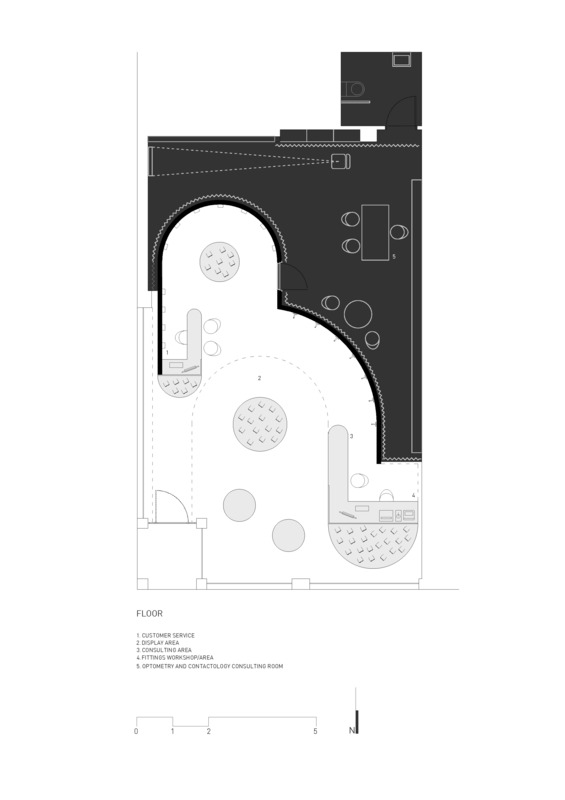 At the back, a second curve with a smaller diameter of 3.25 m intersects with the larger curve. 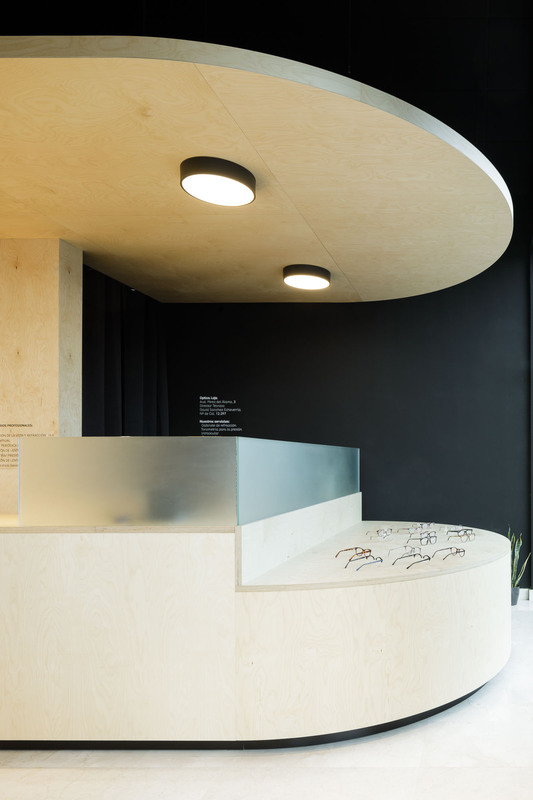 Here, the height is reduced by means of a dropped, birch-panel ceiling, thus generating a cozier and more private space in the personalized attention area around the second counter. This second curved space replicates the first space providing the same effect by including a smaller showcase and lamp in the center. 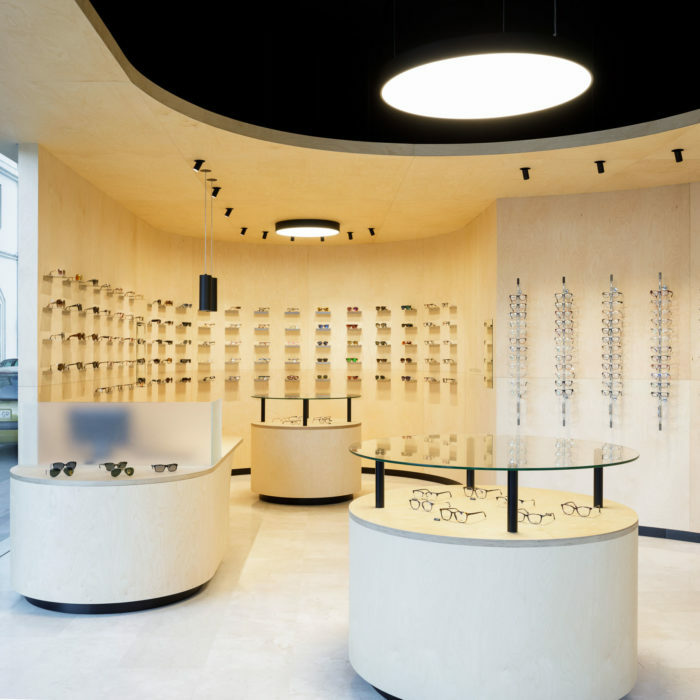 The lighting adapts to the geometry of the curved ensemble and it is placed strategically with respect to the showcases and the merchandise. 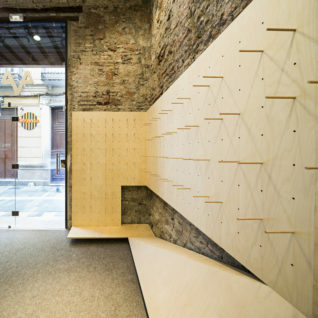 The wooden elements are the only new features introduced into the existing store. 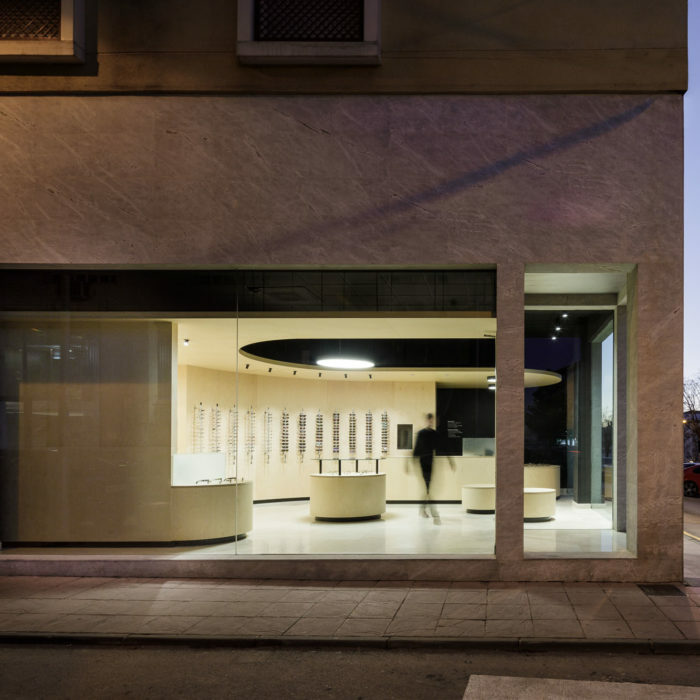 The preexisting beige marble floor, the glass shop windows and the Portuguese marble finish of the facade have all been preserved. 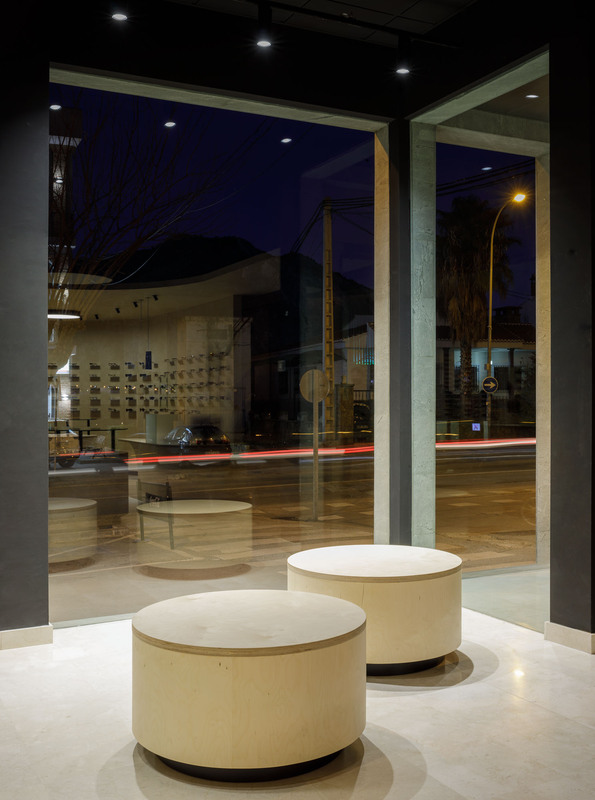 The black coloring of the perimeter walls, of the preexisting dropped ceiling and of the curtains creates a backdrop that allows the shape and the content of the new use stand out when seen from the street. 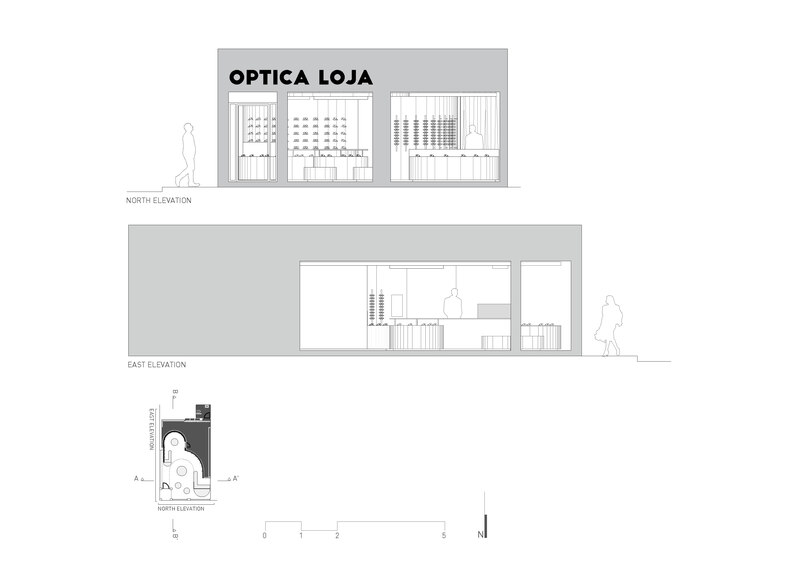 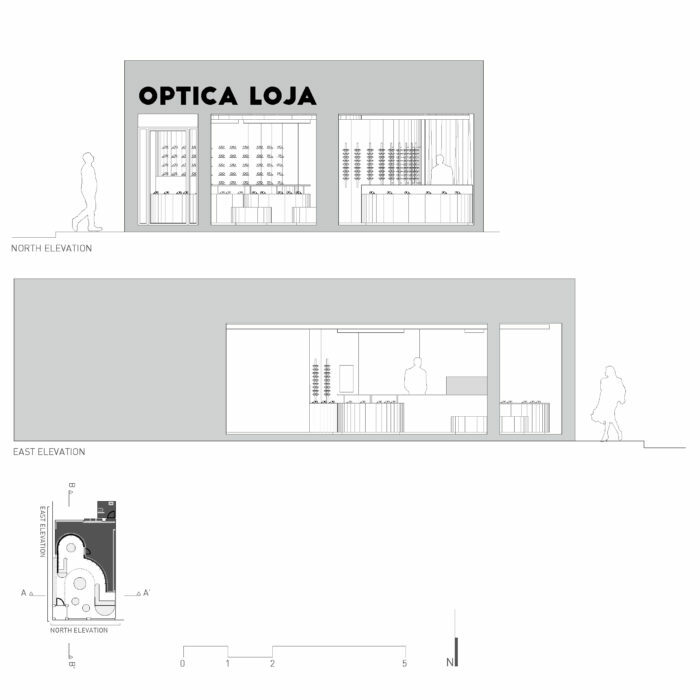 client: Optica Loja S.L. 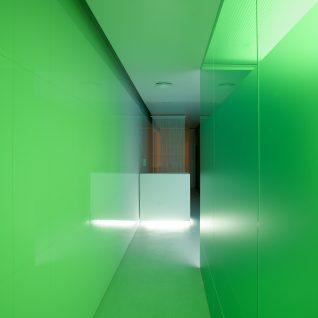 (David Sanchez Echeverría). 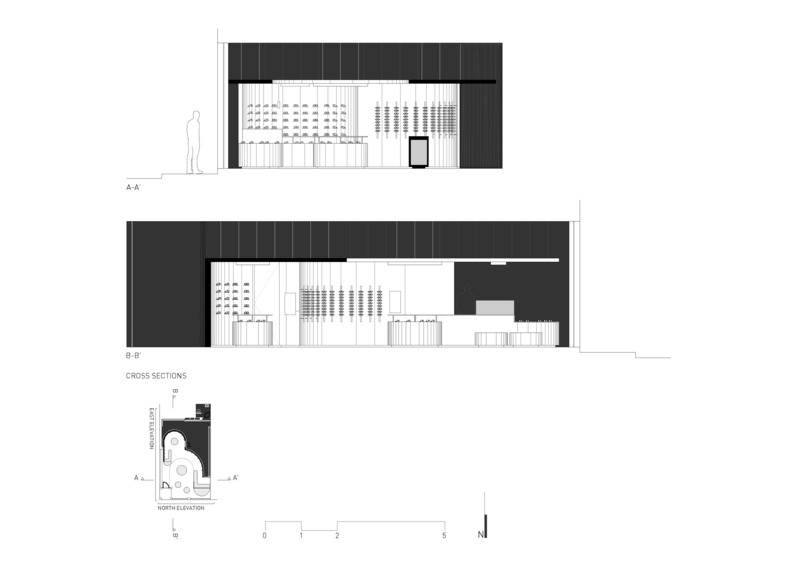 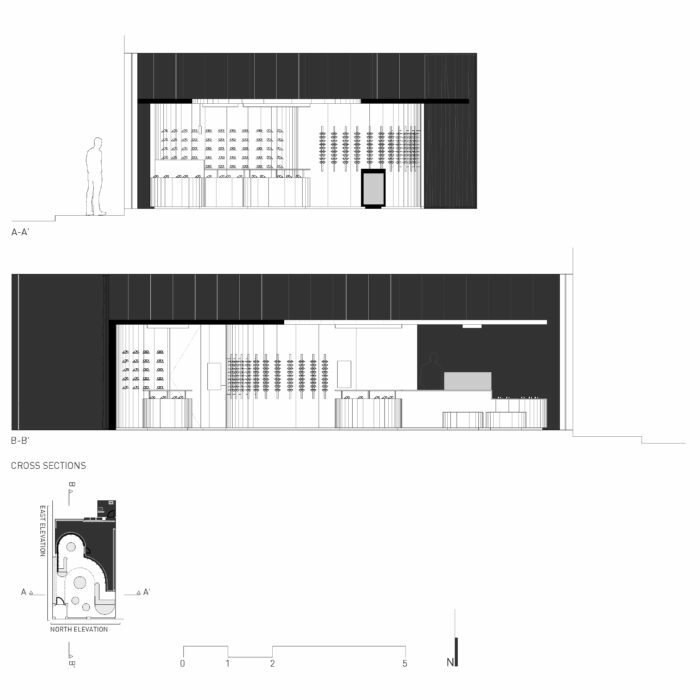 collaborators: Aida Caballero Sanchez(architec), Daniel Usero Guerrero (architect).